For many years Peer carried out important work on the EFG website without recompense and with little public acknowledgement. We are delighted to recognise his support for the EFG with this Musical Encyclopaedia. John Shanklin has for a long time been deeply involved in the politics of geology in UK. He helped to create the Institution of Geologists (IG) and later was involved in the merger of that organization with the Geological Society. This led to the establishment of the title Chartered Geologist. John Shanklin has given over 20 years of his life to the EFG. At the end of the Seventies, he was one of the group of far-sighted geologists who understood the necessity for geologists across Europe to join together to protect and to develop their profession. Thus in July 1980, when the Federation was born, John was elected to be the first President. He successfully guided the EFG through its formative years, helping to develop its policies, to draft the first dossiers and to start the process of enlargement. 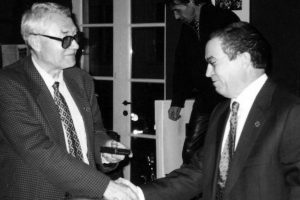 So in 1983 he was able to hand over to the late Renzo Zia a fast-growing organisation. Then in 1989 when he was attending the World Geological Congress in Washington, USA, he met Bill Knight and other members of the American Institute of Professional Geologists. This lead to the exchange of information and visits which culminated in the establishment of reciprocal associate membership in 1998 between our organisations. When John ceased to be the UK’s delegate, he was soon drafted in to serve on the Registration Committee for the EurGeol title. Here he has served diligently, first under Franz Goerlich and now under Eric Groessens. The EFG owes a huge debt to John Shanklin and I am proud to propose him to be awarded the first Honorary European Geologist title, on the EFG’s 20th. Birthday. 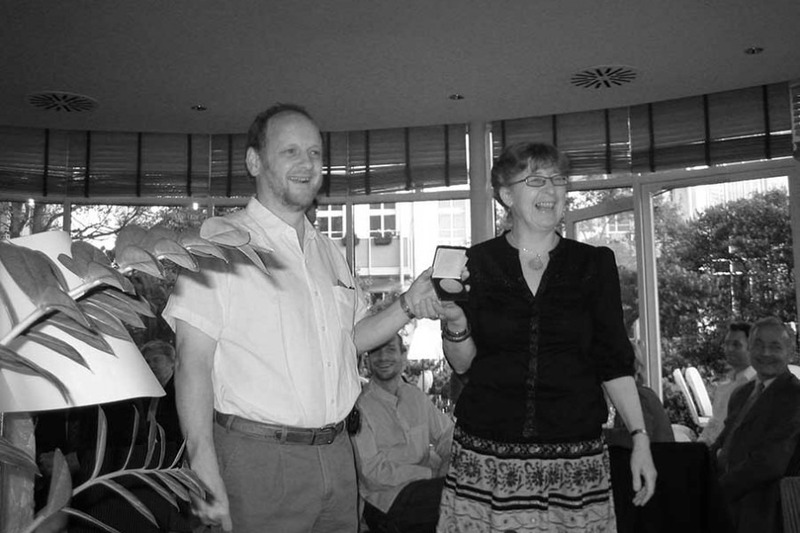 Professor Eric Groessens is a distinguished worker at the University of Louvain la Neuve where he specialises in Carboniferous limestones and in conodont microfossils. He is also a senior member of the Service Géologique de Belgique. However it is for his contribution to the field of professional geology that we propose to honour him. Eric Groessens was one of the original delegates representing Belgium at the foundation of the Federation in Paris in July 1980 and he has been involved with the Federation in many ways ever since. 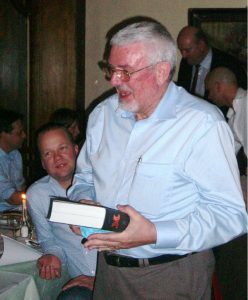 In 1995 he became the Chair of the Federation’s Registration Committee and oversaw the scrutiny of applications for the EurGeol title, with his panel of committee members. A role that developed as the title developed and which he passed on to Richard Fox in June 2001. Whenever the EFG has met in Brussels in recent years, Board and Council venues in the Belgian Geological Survey or the National History Museum, have been organised by him. We are deeply indebted to him for this also. However the culmination of his contribution to professional geology in Europe has been the quiet organisation of a situation whereby the EFG, through the collaboration of the national member, the UBLG, has opened its new office in the Belgian Geological Survey in 2001. We are proud to propose Eric as an Honorary European Geologist. Richard Fox first represented the United Kingdom in 1984, when he supported John Shanklin, then the immediate Past President. 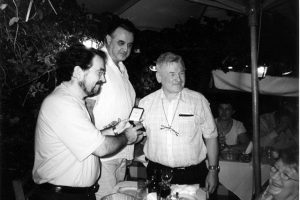 In 1986 he was elected to the position of Vice-President under President Gerald Clement and in 1990 himself became EFG President serving for 3 years until 1993. During his time, the profile of the EFG was raised across Europe and countries which joined were Ireland, Sweden and Finland, with Denmark and the Netherlands in process. He was particularly involved with connecting to the European Parliament and the European Community. In 1992 he organised the presentation of the EFG Groundwater Dossier to the Europe Parliament where many of the MEP’s involved with the Groundwater Directive attended. It was under his direction that contact was made with professional Engineers, Chemists and Biologists who were drawing up codes of Conduct, and European Titles. This lead to the Title of European Geologist being passed by the EFG Council, with the first EurGeol’s being awarded in 1993. These included Eva Paproth a long-standing German representative, supporter and past EU Delegate. Institute of Professional Geologists through Bill Knight, Executive Director of the AIPG. This eventually lead to the reciprocal Associate Membership between the EFG and AIPG. Although he retired from representation in 1996, he was still heavily involved in important auxiliary roles including Chair of the Registration Committee and then the Registration Authority, which he concludes with distinction in London in June 2004. 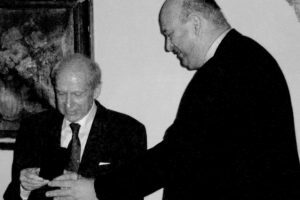 Above all Richard was a fine representative of the Federation and we all remember his consummate skill when in 1992 he addressed first the Regional Assembly of Castilla Y León in Salamanca, Spain and later a special meeting of the European Parliament in Brussels. 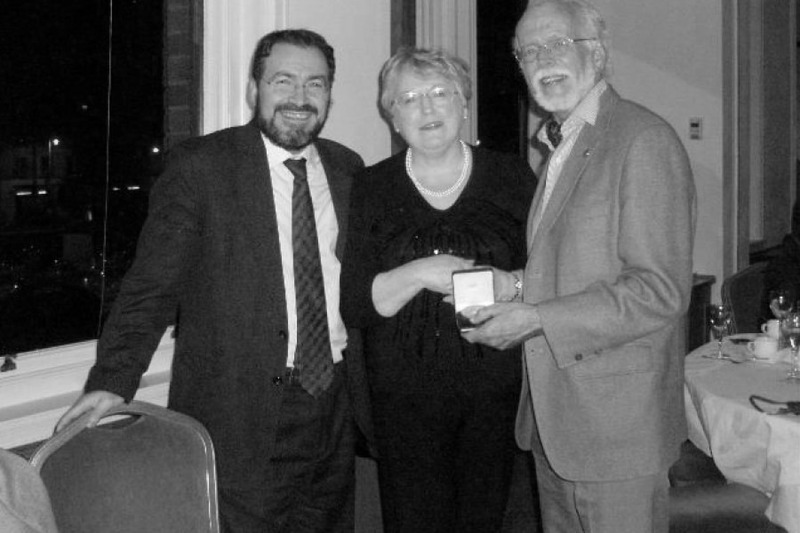 We are proud to propose Richard Fox to be awarded the EFG Medal of Merit. 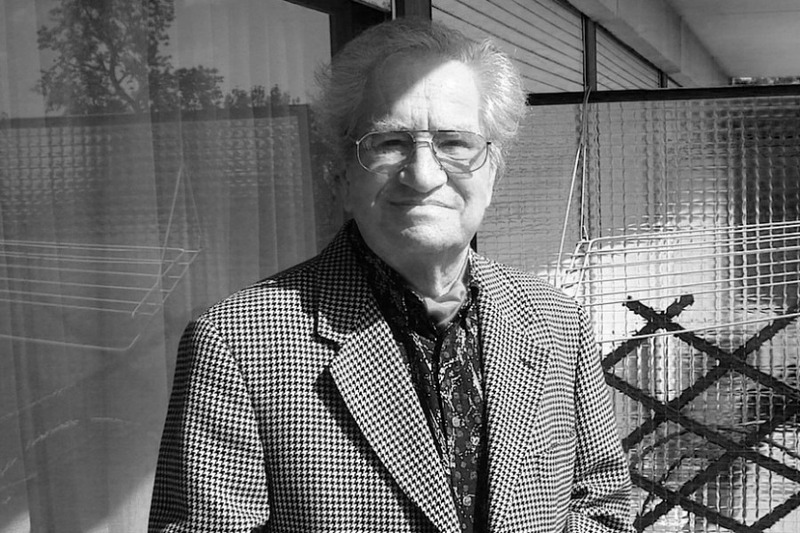 Renzo Zia was born in Livorno (Italy) in 1929 and died in December 1996. He graduated with full marks in Geological Sciences at Pisa University in 1954. 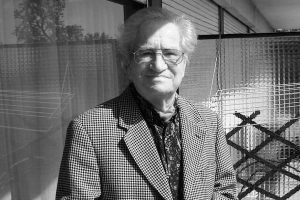 He was a researcher of CNR Study Centre for Geology of the Apennines and an Associate Professor of Geology and Lithology at Pisa University. For several years he has worked as an independent professional in environmental and applied geology, geotechnics and hydrogeology. 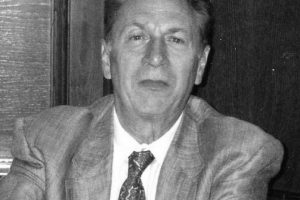 Renzo ZIA was a member of many associations and committees, consultant to Development Agencies and adviser to Public Bodies. He worked abroad, as FAO expert and U.N.I.D.O. adviser in hydrogeology in Africa and Middle East. Since the date of the EFG’s foundation in 1980, Renzo ZIA was a Member of the Council and was one of EFG’s early Presidents, from 1983 to 1986. He also has served on the Editorial Committee of “The Geologist” Magazine. He was a Member of the Board of ONGI (now CNG) from 1975 to 1985, and President from 1979 to 1985. He has always distinguished himself by a civil action of charge and incentive, in order to obtain a correct national environmental policy, the use of sustainable development of natural resources and the promotion of legislative instruments in the problems of soil defense and civil protection. He has to be remembered as providing an example of ethical strictness, for his humanity and for the enthusiasm that he was always able to transfer to young people. In 1976, Gerald Clement, then UFG President convened a first meeting with the President of the Geological Society and the Representative of the geologists of Northern Spain, to discuss the creation of a European Body which should promote and defend the profession all over Europe. Further meetings in London and Paris in 1977 led to the first draft dealing with the objectives of a future European community of geologists including the seven countries of the CEE. 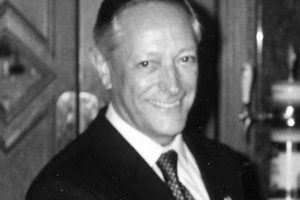 One of the founding fathers of the FEG in 1980, Gerald Clement, as Secretary General proposed to host the EFG legal seat at the Maison de la Géologie in Paris. Gerald was the third FEG President, between 1986 and 1989, and it was under his Direction that contact was made with the European Parliament about the recognition of the qualification of geologists through a harmonization of the formation and qualifications. He fully supported the creation of the title of EurGeol. After his retirement in 1995, he remained deeply concerned in EFG activities. It is a pleasure of the current president to award one of his predecessors; more exactly his great grand father in the chair of the EFG; with the Medal of Merit of the organization. 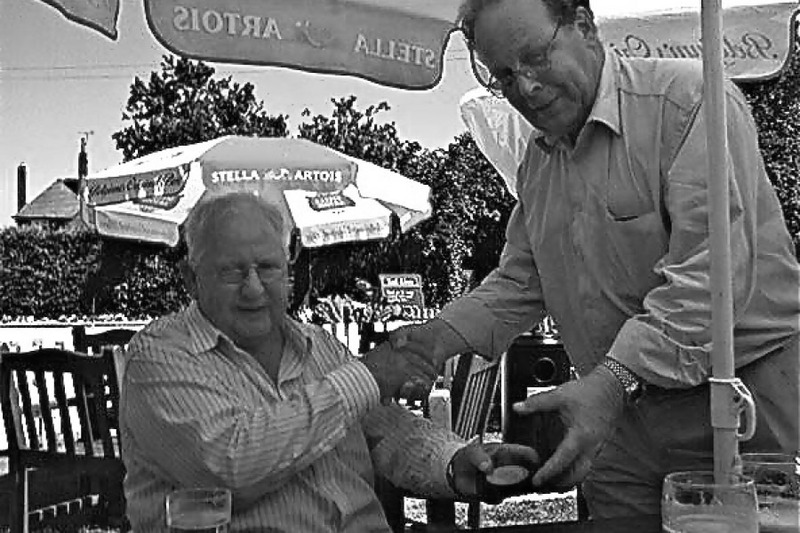 Professor Manuel Regueiro y GONZALES – BARROS, for us Manuel, for closer friends in Spain simply Manolo, is a very discrete man. I simply did not ever find a mention of his year of birth in his CV. Certainly; it is highly confidential; so to say classified data. What we know is that he graduated in 1979 right on time to witness another birth, the birth of the EFG in 1980. It is very important to mention that his career until now has been related to the professional part of geological prospecting; exploring and explaining minerals and mineral resources. In his active career he has twice crosses boundaries within geology which are usually very difficult to cross and if you do; later you often come to the conclusion, that you have bought a one way ticket. Less mysteriously; first he moved from conventional ore exploration to uranium prospection than back to the aggregate industry looking for limestone and mark for the cement industry than again crossed “iron curtain” to join Anadrill Schlumberger in oil exploration and shortly afterwards back to engineering geology. However; with this last switch the period of early adventures in his life has ended – for the time being – and since then he has been active in mineral exploration and geological engineering. Needless to say that such a broad professional carrier has assisted him in being deeply involved in the social life of our profession. In addition to his activity in his homeland; at a very early stage he joined international organizations; including the European Federation of Geologists. As the youngest President of the EFG in office so far and enthusiastically supporting the strategic goals of the Federation (extension of EurGeol, titles and their reputation in many countries, increasing the number of member associations; establishment and maintenance of the Brussels office; establishment of the European Geologist magazine and last but not least the founding father of the traditional wine contest at the Council meetings) he has set milestones in the historical record of the Federation. He has been one of the most devoted guardians of the ‘four pillars’ (copyright Gareth Jones) of the EurGeol title. I would however highlight his ‘fifth pillar’, his excellence in serving, in his words “as a humble geologist”, promoting the aims and interests of the Federation; or those of his National Association over his own. 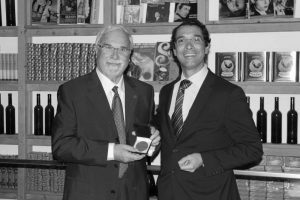 In recent times; such characters are less and less frequent in our society an in professional organizations all over the world; I wish that the EFG will follow his example and in this case this Medal of Merit is the least compensation Manuel deserves for the lessons we learned from him. Manuel, I wish you good luck; good health and happiness equally in your professional and private life”. This medal was awarded to Pietro de Paola in absentia. He is the President of the Consilio Nazionale dei Geologi (CNG) who has guided the transformation of the national organization from its position as Ordinale Nazionale dei Geologi to the present vibrant CNG. The EFG recognized the important work that Pietro has done. 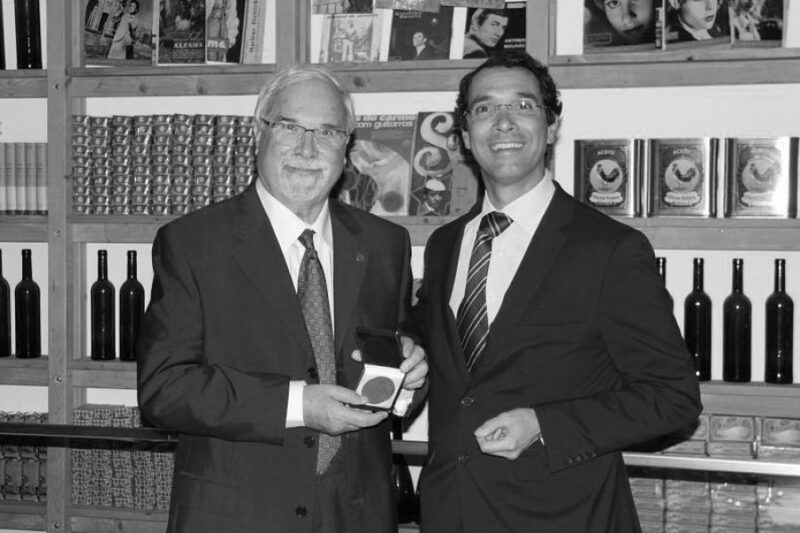 The medal was accepted on his behalf by Marino Trimboli. John Clifford was the EU Delegate on the EFG Board from 2002 to 2005 and made great strides in helping the EFG Brussels Office in its development in those years, especially since he works for a private company. Even from the far distances of South America, John has always fulfilled his duties, and this has always been done well over the requirements and commitments acquired with the EFG. For many years now John Clifford has been a moving force in bringing standardisation to areas of professional reporting. His impressive work on his subject of reference: “mineral resources and mineral reserves classification” representing the EFG, is one of his multiple achievements. With his international contacts he has been a driving force from within and outside the following bodies: Committee for Mineral Reserves International Reporting Standards (CRIRSCO); United Nations – Economic Commission for Europe (UN-ECE) Ad Hoc Group of Experts Meeting; UN-ECE’s United Nations Framework Classification (UNFC); International Council of Mining and Minerals (ICMM); Society of Petroleum Engineers (SPE); International Accounting Standards Board (IASB) Extractive Industry Working Group; Australasian Joint Ore Reserves Committee (JORC); South Africa SAMVAL SAMREC; SME Guidelines; Pan European Resource / Reserve Committee (PERC). As you can see, John is also a fluent speaker of acronymish. Supported unanimously by the EFG Past Presidents. We note that as Director of the Geological Survey of Belgium, Pieter Laga was instrumental in welcoming the EFG to its current office on the fourth floor of the GSB building in rue Jenner in Brussels. He has gone out of his way to make sure that our occupancy was as pleasant and as free from bureaucracy as possible. Whenever there have been problems he has sought to minimise them and to solve them. We are indebted to him for his positive approach to our relationship. Dedicated work for the EFG for many years, first as President, thereafter as a driving force in various constellations, always ready to help whenever help is asked, for to solve problems related to the EFG. Richard Fox recalls that there was a Meeting between National Association Presidents and other EFG Representatives at Burlington House in the early 1990s with the Euro-MP, Peter Beazley. He advised those present that the EFG would not make any progress with the European Parliament unless it had an Office in Brussels, and this was endorsed by the other Euro-MPs that EFG representatives met and spoke to at that time. The Geological Survey of Belgium provided the necessary accommodation after some meetings between the director at that time, Peter Laga and Isabel. Luckily she could explain the potential benefits for BGS if EFG were in the building, and fortunately so far everything has been according to the plan. So it was a great step forward when the Geological Survey of Belgium provided the necessary accommodation to support the EFG – at last we could start to think about having a member of staff. Isabel accepted from Gareth Jones the position of EFG Office Manager during the first IPGC in Alicante in 2000 at the first IPGC. This was a brave leap in the dark – neither side knew precisely how it would work. She grabbed the opportunity with enthusiasm and established the Brussels office, then developed her EC contacts as others have said. Initially, Isabel was ‘part time’ but she put in far more hours than she was ever paid for with 100% commitment and enthusiasm, including cheerfully giving up her weekends for Council and Board meetings. By 2008 she was working for 30 hours a week but since late 2008 she has been full time as she has taken on responsibility for running the EFG contributions to the GEOTRAINET and Euro Ages projects. As co-ordinator for GEOTRAINET, she has done a brilliant job, not only ensuring excellent delivery and budgetary control but also securing the admiration and respect of those with whom she has worked, both within the commission and amongst the project partners. Her personal contribution to EuroAges and her vision in managing and procuring contributions from EFG representatives has been impressive indeed. To have appointed such a superb person as Isabel was a major “plus”. 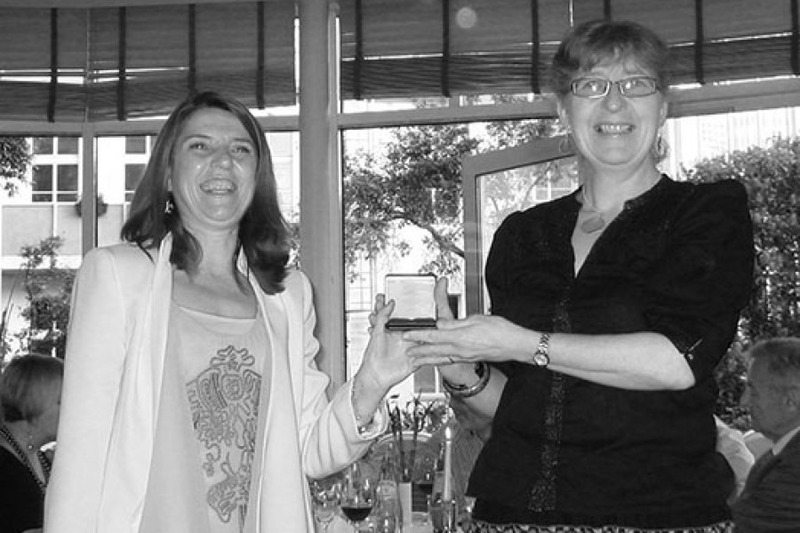 She has always had the support of the EFG Council and particularly the EU Delegates over the years and that is so important in linking up with the National Bodies to maintain the “pulse” of the Federation and to maintain and improve its visibility of geology in Brussels. Isabel has, with her enthusiasm, her great capacity for analyzing and planning strategically, and her helpfulness coupled with a unique charm created a wonderful atmosphere at the Office. She has been, and continues to be, a real “Jewel” in the EFG Crown and has done so much to give the Federation credibility in the EU with good links to the European Departments. In late 2008 EFG, with its partners, commenced work on the GEOTRAINET project. As one past president put it: “how she has managed to be so active and the face of the EFG in Brussels as well as looking after her family is a mystery, but she is a great asset”. 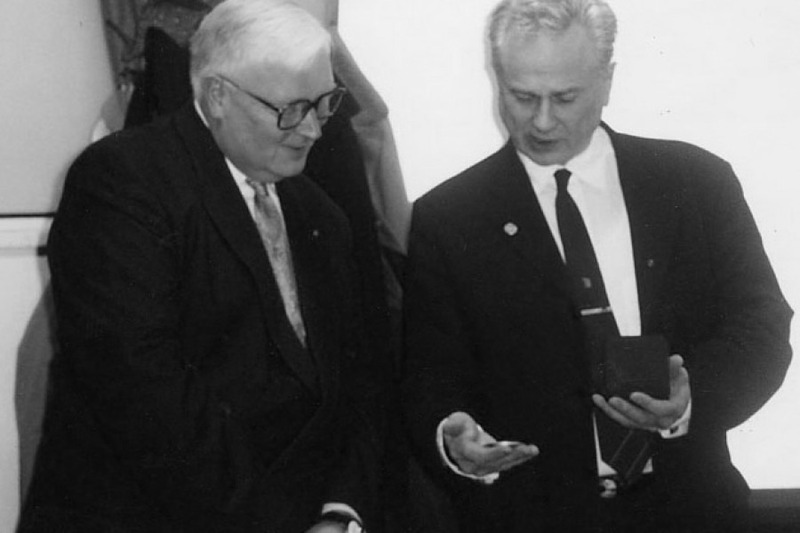 Christer Åkerman attended his first council meeting as Swedish delegate in June 1992 in Salamanca. Since then he has attended over 30 council meetings turning in an exemplary attendance record. This diligence underlines every aspect of this most professional of professionals. It might be worth mentioning that on the second occasion that the EFG meeting was held in Sweden (in 1997) the EFG Council was received by the Major of Stockholm in the same place were the Nobel prizes are awarded. This notable event was organized by Gunnar and Christer. It was during that meeting that they had the good idea of serving Spanish red wine in the dinner which crystallised into a brilliant idea of organizing a wine contest. This event has become a standard at EFG meetings and the many contests since then have contributed greatly to internal communication within council. The Spanish particularly thank Christer for this contribution to their ego in the wine contests (often, though not always, won by Spanish wines). He is also a travelling geologist and has visited many parts of the world, usually leaving his family behind. There is the old saying that the best geologist has seen the most rocks, and on this basis Christer must certainly rank among the best geologists. We must not forget his contributions to the profession of geology, both in his home country and in Europe more generally. Within Sweden, he has fought throughout his career to raise the profile of geology, playing a leading role in the Academy of Sciences (geology branch) and in the organisation of Geology Days. In Europe, he has led by example in practising his subject to the highest standards both technically and professionally. In both of these areas he has continuously striven to promote the importance of the professional title and CPD – without which we, as professionals, would not be able to face the public. Christer was President of the EFG from 2002 to 2005 and his term as president was characterized by his flair in running meetings to time, to the Agenda (approximately) and in particular his prudent way of doing things. His enthusiasm (yes even for meetings) is an example to us all, and we have all benefitted when he was providing both his guidance and wit at Council and PP’S Meetings. Christer has done Trojan work over the years on behalf of the EFG. One of his greatest qualities was his ability to “smooth troubled waters” which we know is not always easy when so many Countries are trying to put forward their views, and often in a foreign language. He is a “Great Diplomat” and has superb natural skills in dealing with people from so many “Cultures”. On top of all this he is a man who always displays the personal attributes of good humour (actually much of his humour is really corny! ), a gay outlook on life (in the old fashioned sense) and a deep sincerity in all his personal relationships and dealings. He is always fun to work with, to such an extent that he leads us all through more work than we thought we were actually doing – the mark of a professional colleague and leader. … and his often terrible jokes. So in order to Finnish off without Russian you, I will just Czech that we have covered everything and Croatia (create) a toast to congratulate Christer on the well deserved presentation of the EFG’s highest award, the Medal of Merit. Antoine was a delegate from 1995 with the Union Française des Géologues (UFG), the French National Association member of EFG that he also was president of for some years, and he is still a French delegate. He became a European Geologist early in 1997 and joined the Board of the EFG as Secretary General in 1999 and served until 2002. He took the new post of a dedicated Secretary General with enthusiasm. After leaving the Board he took on the chair of the International Licensed Body (ILB), a post he still has today. Antoine is still translating the English abstracts to French ones for the European Geologist magazine. For 16 years Antoine has been serving the EFG in different ways in spite of being involved since 2004 in fresh water research in the Comores, Mali, Niger, Togo and Haiti and also in mining projects in China and Kosovo, as a geological/geophysical expert, and it is largely thanks to Antoine that UFG came back as a member of EFG. 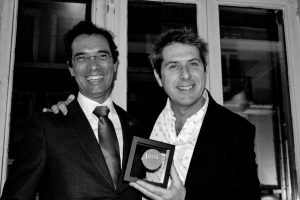 Since Antoine is also a man of several languages (French, English, Spanish, Arabic), and since he is a very social and humble person, so easy to get on with, Antoine Bouvier is really worthy the EFG Medal of Merit. Peter Styles is one of Europe’s leading applied and environmental geophysicists. He has fully engaged with professional development and academic excellence within his field for some 40 years. Peter Styles graduated in 1972 from Oxford with a BA in physics and completed his PhD on plate tectonics at Newcastle University. His research has focused on geophysical investigations of plate tectonic phenomena and artificial phenomena associated with coal mining and most recently with microseismicity relating to shale gas and geothermal exploration and exploitation. Since 2000, he has been Professor of Applied and Environmental Geophysics at Keel University, where he was also Head of the School of Earth Sciences and Geography and Director of the Research Institute for Environment, Physical Sciences and Mathematics. In his academic life Peter has played a leading role in the delivery of Earth sciences to several hundred undergraduate and postgraduate students, as well as influencing teaching and research staff. He has served the profession in many ways, with considerable beneficial impact. 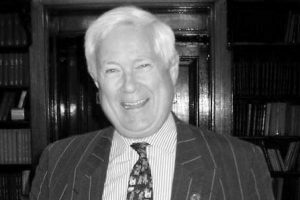 As the Geological Society’s Professional Secretary, he was the UK’s delegate to EFG Council, serving the development of the profession in Europe from 1997 to 2000. He was President of the Geological Society of London from 2004 to 2006, and has served at a high level on government bodies, spending two terms on the board of the British Geological Survey. He has advised the UK government on underground storage of nuclear waste. His work has raised the profile of geoscience within government and with the public, as well as in the advice he has given to industry. He was also President of the British Association for the Advancement of Science (Geology Section) for 2007. He is Editor-in-Chief of Geoscientist and currently conducting a global lecture programme as the first Distinguished Visiting Lecturer in Environmental Geophysics for the European Association of Geoscientists and Engineers (EAGE). More widely, Peter has made a major contribution to current debate on shale gas and the associated hydraulic fracturing, making sure that policy makers and the public are informed of the facts that relate to shale gas exploration. His work in this regard is one reason why the UK Government supports shale gas exploration. Peter applies his knowledge of microseismic activity to geothermal exploration, where again factual knowledge of this process is vital to safe management of exploration and production. 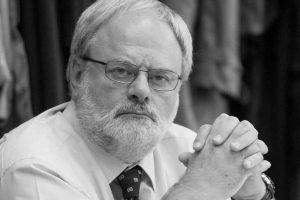 He was awarded the William Smith Medal of the Geological Society of London in 2014 for outstanding research in Applied Geosciences and the Medal of Merit of the European Federation of Geologists in 2014/2015 for persons who have provided exceptional and distinguished contributions to the Federation or to the geological profession in Europe. Born in Lisbon on 12 December 1942, José Martins Carvalho worked for leading companies in the sector of geological resources, including Mining Exploration International, Geotechnical and Mining, Soundings and Foundations ACAVACO, TARH or SOGEO-Azores. His link to the ISEP dates back to 2004, and he supported the development and consolidation of three renowned courses – Bachelor and Master of Geotechnical and Geo-Environmental Engineering and MSc in Sustainable Energy. José was the Portuguese delegate to the EFG during its conceptual years, from 1978 to 1980 and then during its formative years, from 1980 to 1989. He was instrumental in helping to build the basic structure of the EFG, through its statutes, regulations, code of deontology (ethics), etc. In particular he was an active and dedicated Secretary-Treasurer of the Federation from 1983 to 1986. José gives outstanding support for professional geology throughout Europe and beyond. With his quiet authority and leadership he is an example to us all. On a personal basis he is not only very good company but he is also a superb “Ambassador” for the profession, showing integrity and honesty. In 2000, he was awarded the title “Millenium Hydrogeologist” by the International Association of Hydrogeologists in South Africa. Moreover, he is corresponding member of the Order of Engineers (College of Geological and Mining Engineering), senior member of the Portuguese Association of Geologists and member of the EFG Panel of Experts on Hydrogeology. In 2015 José’s many achievements were marked with the publication of a thematic issue of Environmental Earth Science (Volume 73, Number 6, March 2015) in his honour. Iain Simpson Stewart, MBE FGS is a Scottish geologist and currently Professor of Geoscience Communication at the University of Plymouth. He graduated in 1986 from Strathclyde University with a first class honours Bachelor of Science, he obtained his doctorate, entitled “The evolution of neotectonic normal fault scarps in the Aegean Region” in 1990 from the University of Bristol. From 1990 to 2001 he taught geology at the West London Institute of Higher Education and then Brunel University London. After a couple of years in Scotland as a science broadcaster he took up a lectureship at the University of Plymouth, becoming Professor in 2013. He is a member of the board of directors at the Centre for Research into Earth Energy Systems, University of Durham. He is a Fellow of the Geological Society of London and President of the Royal Scottish Geographical Society. He is a patron of the English Riviera Geopark, a member of the Scientific Board of UNESCO’s International Geoscience Programme, and also a member of the UK National Coordinating Centre for Public Engagement’s Academic Action Research group. Internationally known both for his academic expertise and charismatic ability to communicate with the general public (he was a child actor on TV at the age of 14), Professor Stewart’s expertise is in the area of Earth hazards and natural disasters, particularly in identifying past major earthquakes, tsunamis and volcanic eruptions in the Mediterranean region. Through his television programmes he has brought the reality of geology to everyone in showing globally how geology has generated the environment in which we live, the catastrophic forces that have affected mankind and the climate change issues that shape our future. In 2010 Iain Stewart was recognised by the Royal Geographical Society for “popularising geography and earth sciences”. He was appointed Member of the Order of the British Empire (MBE) in the 2013 Birthday Honours for services to geology and science communication. In 2013 Stewart was the recipient of the Athelstan Spilhaus Award by the American Geophysical Union.